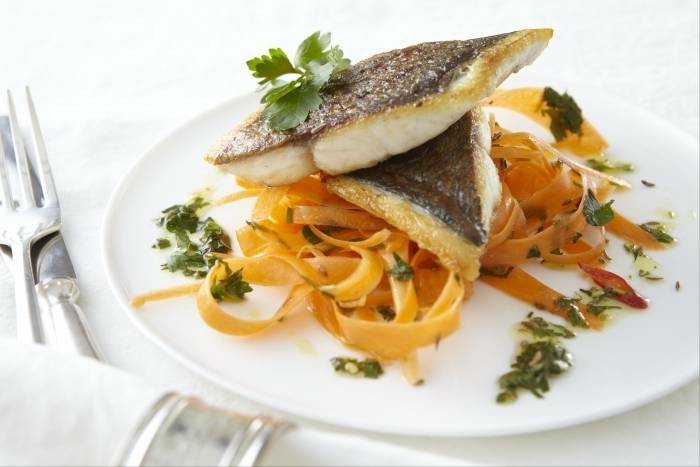 Seared sea bream with a delicious fragrant carrot ribbon salad. Pin bone and trim the fish into neat portions. Season on both sides. Heat a pan with olive oil and fry skin side down until crispy. Turn the fish over, remove from the heat and let the residual heat finish cooking the fish. Cook the new potatoes in boiling water until tender,drain then and crush with a fork, add the butter and cumin seeds and keep warm. Peel the carrots and slice lengthways finely on the mandolin. Crush the garlic into a paste, finely chop the chilli and parsley. Zest and juice the lemon. Dry roast the cumin seeds in a pan then add the oil, chilli and garlic. Fry for a further 2 minutes then pour over the carrots. Finish with the lemon juice, zest and the parsley. Season to taste. Spoon the crushed potatoes onto the middle of the plate. Place a neat pile of ribbons in the centre of a plate and lay the crispy fish on top. Drizzle any dressing around the side.